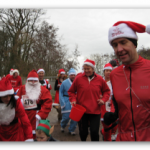 For just GBP 15, every runner receives a Santa Suit, a chipped race number and a brilliant supported run around the beautiful Draycote Water. But wait, there’s myrrh. After the run, you’ll be rewarded with a mince pie, goody bag and a unique Santa-themed souvenir finishers’ medal! You won’t get a better chance to take a Christmas (s)elfie. Spaces (and Santa Suits) are strictly limited (we can’t have anyone feeling Claus-trophbic). Enter online before we sell out!